Last evening, the wife and I had a dinner date that included attending a performance of Silkroad Ensemble at the Maxwell Theater over at Augusta University. I am always game for musical entertainment that may perhaps broaden my perspective a bit so a hybrid fusion ensemble of talented musicians seemed like a nice evening event. I am not a musical expert, let us establish that up front. However, I do not believe I actually heard anything that could pass as actual music last night. At one point early in the presentation one of the performers mentioned how the group was formed some twenty years ago to bring together all sorts of musical styles, put them in a pot and cook them into what Silkroad produces. They mentioned that 2+2 could be 5. As a metaphor, I could accept the premise. Concerning music and what music actually is, I cannot. Good music in all places, times and cultures has followed certain mathematical rules. At another point the musicians stood on stage, essentially silent for 45 seconds, perhaps two minutes, I do not know for certain, doing ma. Ma is Japanese for a pause or gap in a sequence. I looked about the crowd in attendance and it seemed to me folks thought this was the most brilliant thing possible. I saw seven people standing on stage not playing music. I actually had to stop the wife from laughing out loud at this point. You can look anywhere, across history, and find that some cultures added 20+20 to get 40 and others 200+200 for 400 and others 5+5 to arrive at 10, etc., but all followed what can be clearly interpreted as mathematical rules to produce actual music that humans enjoy. Good music follows a mathematical ratio, the golden ratio, that all humans everywhere recognize. Tempo, style, instrumentation all vary, but real music always follows this rule. In fact, all art, architecture and even what we perceive as beauty in other humans is related to how closely something aligns with the golden ratio. It is almost like this is the mathematical basis of beauty that God wrote into the universe when he created it and we all intrinsically recognize it even for those that do not recognize a Creator. When one of the performers stood up and told the crowd that 2+2=5 they actually meant it. Each performer clearly had talent in playing various instruments, but what they did on the stage was not at all music. It is not that I did not like it, that is not relevant. I can dislike a style of music but still, accept that it is actually music. My radio dial is filled with music that I dislike but that I still accept as actual music. It is not that I am an ignorant creten that simply cannot appreciate art. I may, in fact, be such, but as a human, I am attuned to the universal law of math and the golden ratio, I can easily discern noise from art. The question I ask is why would otherwise talented people travel the world performing noise rather than music? Why would educational institutions such as Augusta University spend money to bring talented people to the school so that they can perform noise? Why would a small audience sit and pretend that they “get it”? Well, the answer to those questions are not very pretty I am afraid. 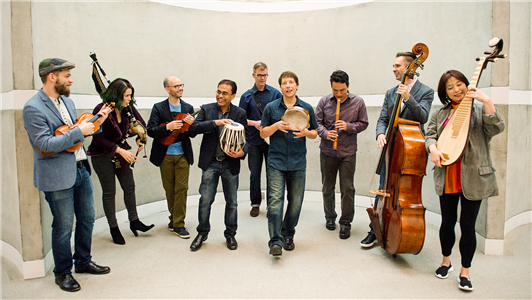 Silkroad creates music that engages difference, sparking radical cultural collaboration and passion-driven learning to build a more hopeful world. Seems innocuous enough, after all, who can really be opposed to a “more hopeful world”. There is, however, I suspect a lot of imagery and code in that simple sentence. When a person tells you who they are, you ought to actually believe them. The 2+2=5 statement at the beginning of the show was not merely a metaphor for perhaps thinking differently. It was a statement that these folks believe that the foundation of what has come before is not worthy of their time or effort. It is essentially a statement that the rules of the universe, created by God, are not relevant to them. It is a bold statement of rebellion against tradition. They might as well have stood on stage and stated that the Earth is flat and gravity does not exist. There is a palatable ideological bent to this group. In the free market I would say let these folks make what ever noise they want and try to sell it as music. In a truly free market they would be on the side of the street with a bucket accepting donations for supper. However, the market this ideology exist in is not free. It is supported by funds from large endowments and educational institutions. Make no mistake, the profit this group took from their performance on Saturday was not based upon ticket sales. Augusta University paid to have this group here under the guise of providing an enlightenment opportunity for students (I saw few students in attendance by the way). As a public institution, this means that ultimately two groups paid for this, the taxpayers and students out of their tuition and fees. Imagine that some student will pay some small amount of interest on the cost of this for the next 30 years in the form of repayment of student loans – all in the name of allowing a few eccentrics the luxury of declaring that they are smarter than all of the world’s great composers and musicians to come before them and smarter than God himself. This performance was nothing more than another expression of the supremacy of man, a self-centered secularism that seeks to dispense with all that has proven good and acceptable through centuries of human history. It was not just the innocent act of a few otherwise talented musicians banging on drums to produce noise that three eight-year-olds running amuck in a music room might similarly produce. I enjoyed the evening, dinner was nice, accompaning the wife was nice and watching this event was informative, but I am left to shake my head at what passes for art and enlightenment. Southerner, father, husband, Christian and a retired Army field grade officer. This is all about my personal journey, shared with the world, that I hope encourages us all to seek and find purpose, fulfillment, and happiness in the years after retirement from the military.